You might not imagine Al Capone, the infamous prohibition era gangster, as a character in a scholarly treatise on theater, but he has more than a walk-on role in Elizabeth A. Osborne’s Staging the People. Ms. Osborne’s research into the life—and unfortunately, the death—of the Federal Theatre Project (FTP) goes well beyond the project itself. She reveals the full scope of the cultural environment in which the grand experiment existed and shows the ways in which that environment contributed to the theater’s successes and failures. 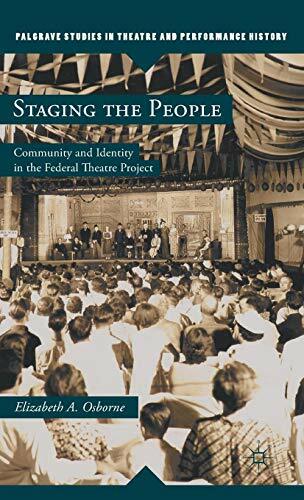 The Federal Theatre Project was the U.S. Government’s attempt to give this country what almost every other major country has: a national theater. The short-lived FTP (1936 to 1939) was part of President Franklin Delano Roosevelt’s successful and very active stimulus program that helped pull the country out of the great depression. The program differed from the current approach to economic recovery in that it focused not only on public works such as the bridges and highways built by Roosevelt’s Works Progress Administration (WPA), but also on the arts. Chicago was the site of a major regional branch of the Federal Theatre Project and the Chicago of the 1930s was more or less ruled by Capone. His connection to the project, through the numerous politicians he controlled was more than casual. The gangster, and a coterie of bodyguards, also attended many of the local theater performances. Another surprising influence on the Federal Theatre Project’s Chicago branch was the war against the ravages of syphilis. The disease was the subject of a high profile FTP production called Spirochete that documented the history of the sexually transmitted illness and its impact on the community of the time. Ms. Osborne’s book shows a 1930s political atmosphere not that dissimilar to the current one. For every supporter of the way Roosevelt’s New Deal included the popular culture and the arts in his path to America’s recovery there were vociferous attackers who decried the work of the playwrights, composers, actors, muralists and others who were part of the president’s federal arts programs as leaning too far toward the political left. Regional subdivisions of the FTP, in Boston, in Atlanta, in Portland, Oregon, and others, each became focal points of controversy. The directors of the project in each area tried their best to circumvent the storms generated by critics, local politicos, the Ku Klux Klan, and other attackers. Scripts were changed, scenes were added or excised, but in spite of self-censorship, and contortionist-like efforts at cooperation, the controversies continued. Eventually the Congress of the United States passed legislation that cut the lifeline of the Federal Theatre Project. The foes of President Roosevelt’s progressive New Deal won that round; however, even though its life was short, the FTP managed to make a permanent mark on America’s cultural landscape. It exposed new audiences to live theater and employed artists who might otherwise have starved, or left the arts in order to survive. Ms. Osborne’s book is academic in structure and outlook, but it is difficult to avoid being swept along by her obvious enthusiasm for her subject. If there is a flaw in the work it is that she sometimes becomes so immersed in the moments she describes that she blurs the lines between her descriptions of the action onstage and the offstage machinations. That is a minor blemish on this valuable description of a pivotal moment in American cultural history. Martin A. David is an author, dancer, choreographer, and former frequent reviewer for such publications as the Los Angeles Times.